Don’t leave home without it. No, I’m not talking about your American Express card, I’m talking about your onX Hunt system. Technology has come a long way and it’s well worth your time to learn and understand the new digital scouting tools that are at your fingertips. Fitness, weather, hunting pressure, mental attitude, scouting, and time are all terms thrown around a lot when it comes to preparation for our fall hunts. Scouting is towards the top of that list for me. 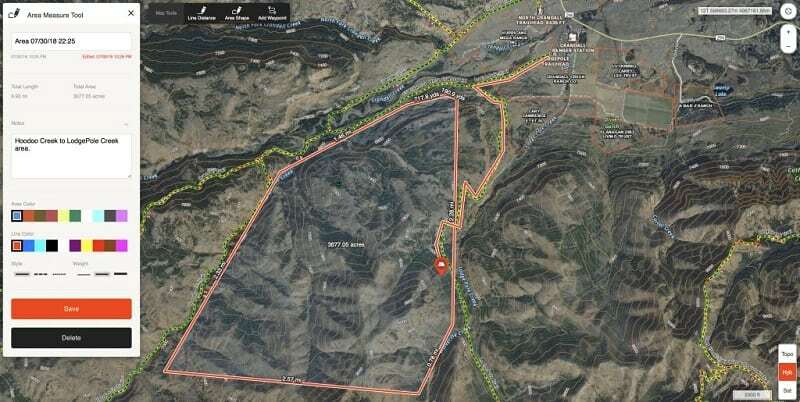 With today’s technology, it’s literally possible to scout a unit, and a specific area within a unit, right from the comfort of your living room all while enjoying a beer and elk steak. This is definitely one of those times when you should be working smarter, not harder. I started using onX while hunting some heavily checker boarded land in Wyoming. I was chasing around a big antelope buck that was constantly bouncing back and forth between public and private. I was able to hunt a secluded waterhole tight to a private border that would have been hard to determine if not for the map chip. The following season, again in Wyoming, I tagged my first muley buck solely because of that map chip and some paper map coordination. Since then I can’t tell you how many Deer, Antelope, Turkey, Bear, and Elk have been sizzled on the grill because of onX… dozens at least. If you think big picture, this isn’t just a “hunting” app. I use it for berry picking, mushroom hunting, shed hunting, fishing access, hiking, and more. Depending on your needs the opportunities are endless. There are two options for onX, you can use the GPS chip or the app. I am “old” school and have been using the chip since the beginning, (*editors note: the app now has more features and options than the chip.) The “chip” is a micro SD in plug and play format. The micro SD also comes with and an SD adapter so you can just plug it into your PC and look at everything on the big screen. This option is much easier, faster, and more efficient than scrolling on your GPS screen. The map chip runs $119.99 per state. The second, and quickly becoming my more preferred option, is the app. With the app, there is no SD card to worry about, no GPS. It’s all done via your smartphone. Advantages of the smartphone are a bigger, brighter, and clearer screen. The ability to use the touch screen for zooming, dragging, marking and typing quickly becomes apparent, especially after switching from one to the other. The Premium App is $29.99 per state per year or the Elite membership which is $14.99 per month, or $99 per year for full access to all 50 states. If you break that down its 27 cents per day to have the opportunity to scout all 50 states 365 days per year. Seems pretty simple to me. onX is very in-depth, but not to be confused with complex or hard to use. It has a lot of simple “layers” that are very user-friendly by simply toggling on or off. Although feature rich, the onX platform is very simple to navigate. A “layer” is simply another term for an overlay that can be added or removed to your visible topo, satellite, and hybrid views. One of the most widely used layers anywhere would be the State Unit map layer. This layer shows your particular state broken down by the game unit number of the species selected. These can all be simply toggled on or off at any time to fit your needs. If you look at the center of this picture you will see a grey information balloon. This is where I clicked my mouse to find out details. Once I did that you can see the upper left of the screen opens up a grey information box. In this box is all of the pertinent information for that area. 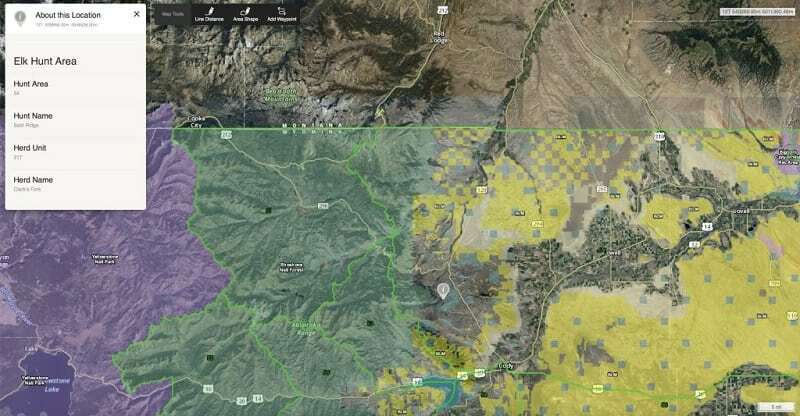 You’ll see the landowner (BLM), Hunt area (54), acres of hunt area (262,230), Hunt Name (Bald Ridge), Herd Unit (217), and the Herd Name (Clark’s Fork). 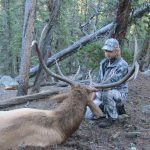 You may not want any more than the unit number and the owner, but the other info can be very useful if looking for more information when speaking to biologist’s, fish and wildlife, etc. This is but one of many layers available. Each state has its own section. Hunt- Hunting specialty layers, like the current and historic wildfires, timbercuts, etc. Trails & Rec- Trail maps and statistics, and general outdoor recreation information. Water- Nautical charts, Great Lakes Bathymetry, and River Stage Forecasts. These can all be customized by moving from the “Layer library” to your own personal “My Library” tab. These are simply toggled on and off and tapped into or out of the libraries. Very simple. Below are a few more of the available layers. Boone and Crockett Records, Roadless, Historic Wildfires, USFS Timber Cuts, Private Lands, Public lands, Public Access, Walk-in Hunting areas, Trails, Trail Slopes, Trail Mileages, USFS Roads and Trails, Recreation Sites, Forest Visitor Maps, Nautical Charts, Great Lakes, River Charts, Precipitation Radar, QDMA CWD distribution, RMEF, NWTF Wild Turkey, Eastman’s MRS, and current wildfires are a few more. Beyond the layer choices, there are many more functions. In this series of marked up pictures, you will see a few different things. In this picture I have the Trail slope and Distance layers on and used the Area tool to create a general hunt area that I might focus on. With the slope layer, you can see a color graduated gradient of the slope; based from flat to very steep with corresponding green-yellow-orange-red levels. The trail distance is marked in segments from trail junction to junction. In this picture you can see a few more things going on. Near the center of the picture you will see the green number 51. This is indicating that it is elk unit #51 as I have the elk unit layer on. Just to the NE of there you will see a few oddly shaped red boundaries with names in them. I have the private land layer on so you are seeing that information. 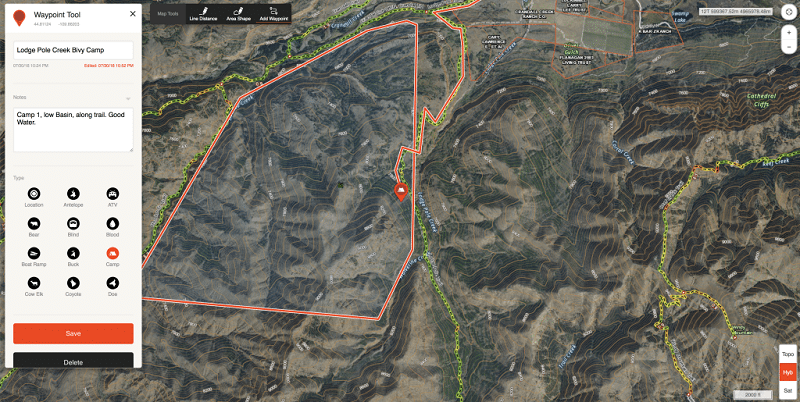 Then you will see a red line that I created, using the map tool line feature, starting from Lodge Pole trailhead to the S/SW ending at my waypoint. Along this line are given distances from the points I created and the overall distance from trailhead to camp of 3.45 miles. This last pic of the map tools is a feature I use a lot. Waypoint is one that I use a ton both on the App/GPS at home and in the field. You’ll see the waypoint symbol where I plan to set up my bivy camp. On the left side you will see the Waypoint tab opened up in Edit mode. This is where I can rename, update, make notes, etc. One thing I’ve found irritating is when this is open it shows my waypoints as deg/min/sec, instead of my preferred UTM grid. It hasn’t been a big deal though as when I’m using in the field I still get my UTM coordinates. In the upper right of the pic you will see my cursor UTM coordinates. In the lower right, you will see the distance scale and the tab options where I select the view I want to see. I spend a good majority of my time in the hybrid view where I can see both the satellite and topo views overlayed on one another. A couple of commonly asked questions I’ll touch on. Areas with no cell service are not an issue. There is an option called off grid/offline. Your phone’s GPS system will work without cell service because it operates off the satellites like any other GPS. Simply download and save your needed maps prior to your trip. Battery life will be shorter than if you weren’t using it like a GPS obviously. I would recommend a portable charger like the Dark Energy Poseidon and you will be set. 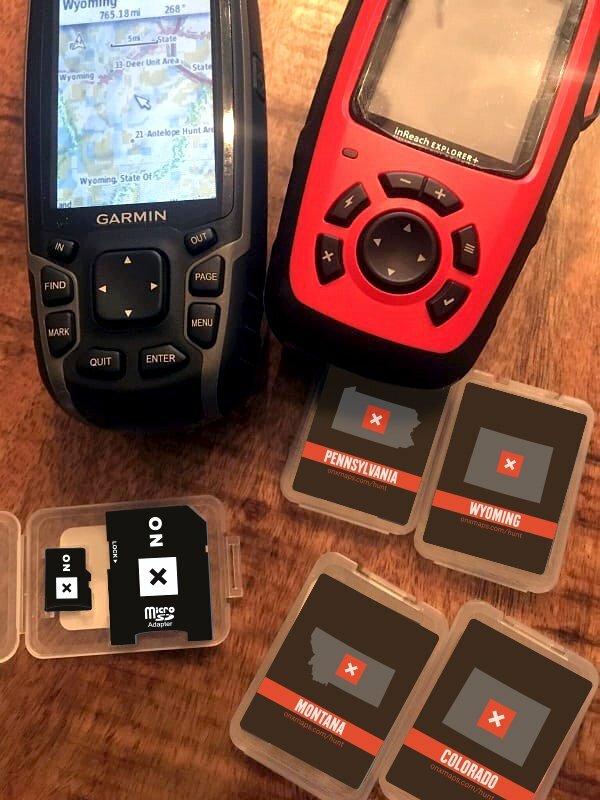 I’ve barely skimmed the surface of the layers, options, and power that are available to you for home and in the field use with the onX mapping system. There are literally hundreds of hours of YouTube tutorials out there to help cut the learning curve and give you tips and ideas. I really like those from onX. I’m not saying that digital scouting is a replacement for boots on the ground information, because it’s not. 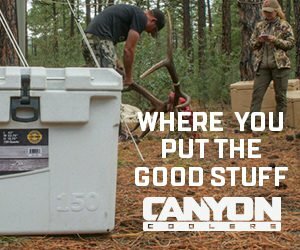 When it’s used ahead of time though it can save you a lot of energy and valuable time while you are in the woods. It can weed out some of those possible junk spots and turn you on to some potential honey holes before you even step foot out of the truck. In my opinion, map study and understanding is one the biggest keys to success. 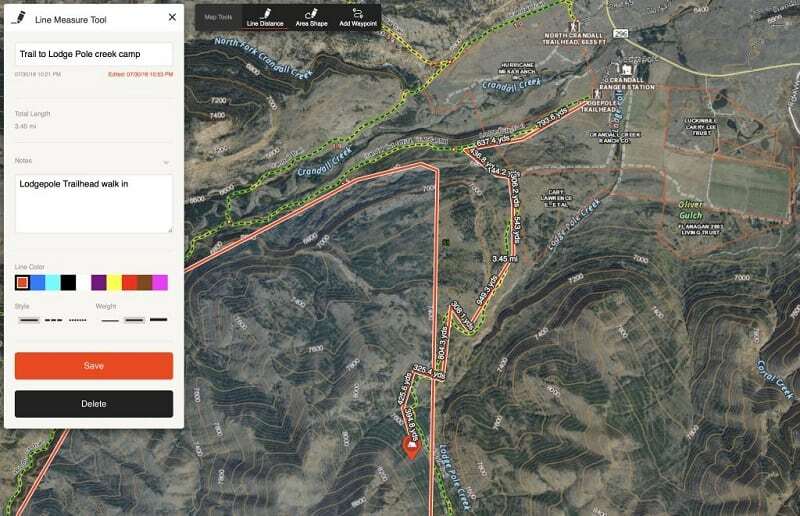 Using onX Hunt in conjunction with paper maps and boots on the ground will no doubt improve your odds. You can comment or ask questions here and follow along on my thread Another Season as we give away an onX Hunt Elite Membeship in the coming days!